The Café Mocha Show, one of the fastest growing female syndicated radio shows, kicks off its fall season with the addition of two new major markets, Atlanta and Las Vegas. 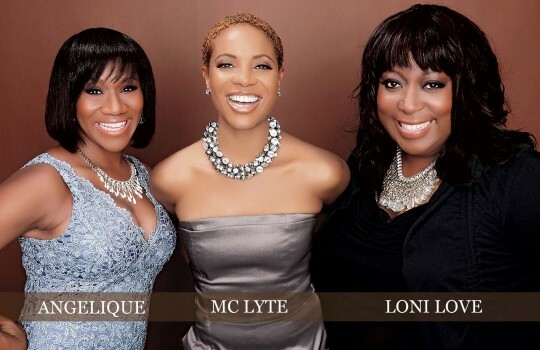 Likened to "The View" of radio, the weekend show hosted by hip-hop icon MC Lyte, comedienne/TV host Loni Love and broadcast veteran Angelique Perrin continues to show the strength of female broadcasters reaching a wide range of listeners. In Atlanta, the Café Mocha Show is now heard on Radio One’s WAMJ (Majic 97.5/107.5), Sunday evenings from 6 – 8pm. In Las Vegas, the show debuted Saturday, September 7, and airs on KCEP (Power 88) from 4 – 6pm. The Café Mocha Show is also currently heard on WBLS (107.5) New York, WSRB (106.3) Chicago, WHUR (96.3) Washington D.C., and WKJS (105.7) Richmond, in addition to 20 other markets across the country. The show, which also airs on Sirius/XM channel 141, has consistently maintained its top-three status in the New York and Richmond, VA markets. To launch its fall season, Café Mocha Show has a lineup of all-star guests that include Dr. Oz, Oscar winner Jennifer Hudson, Bishop T.D. Jakes, Holly Robinson-Peete, NBA legend Theo Ratliff, Grammy winner John Legend, Marsha Ambrosius and Miss Robbie with the cast of "Welcome to Sweetie Pies." The Café Mocha Show also anticipates its bi-annual appearance by First Lady Michelle Obama. The Café Mocha Show ‘s mission is to be a multi-platform vehicle designed to reach women where ever they are from mobile App, podcast and via a new, soon-to-be re-launched, redesigned website, www.CafeMochaRadio.com, bringing a fresh blend of ideas and real talk for women on the go!